Channel Master # 180277-RB-500 RG6 coaxial cable is DISH Network Approved and swept to 3.0 GHz. It has 60% aluminum braid and 100% aluminum foil. The center conductor is 18AWG copper clad steel. UV inhibitor jacket. UL and CL2 approved. 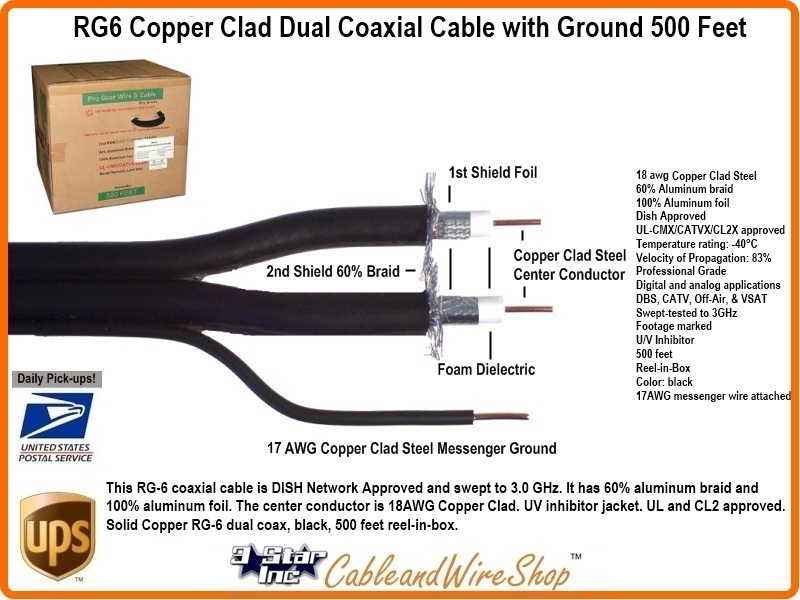 Copper Clad RG6 dual coax, with 17AWG messenger wire attached black, 500 feet reel-in-box. Note: 60% Shield - CCTV and Limited Distance Wideband Cable for Computers, Broadband, CCTV, MATV, CATV. RG6 3 GHz Copper Clad Steel Coaxial Cable. The 18 AWG CCS Conductor Coax Cable has 60% Braid Outer Shield to Protect the Video/Radio Frequency Signal(s). It provides ample conductance for most BaseBand and Video applications up to 100 feet in length without Amplification. Dual RG6 Cable with an integral web messenger or ground maybe used for Cable TV or Satellite, aerial or premise feed with ground or both depending on bandwidth and messenger material composition. Bandwidthes of 1 GHz (1000 MHz) are typically reserved for use with Cable TV. Today's Satellite use is 2200 MHz (2.2 GHZ0 with cable manufactured to sweep test to 3 GHz (3000 MHz). The "Messenger" is either for Aerial support or grounding or both. If the material is STeel or Stainless steel, it is for Aerial Suspension use. If copper, then it is obviously used for a ground connection/ lightning arrest from the Dish installation. If it is copper clad steel, then depending on the thickness and hardness of the steel, it may be used for both.